I don’t often lead off reviews by discussing a book’s cover. 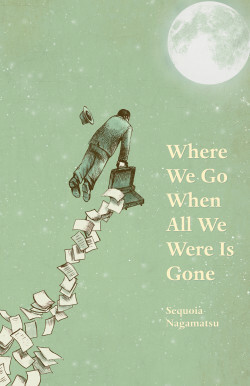 But I’m going to do just that with Sequoia Nagamatsu’s book of short fiction, Where We Go When All We Were Is Gone, because the cover art (a graphite and digital painting by Eric Fan) is so gorgeous. A suit-clad businessman floats in the milky-green sky, papers trailing from his open briefcase, gray fedora lost too as he drifts toward the full moon. It’s sensitive, unexpectedly touching, and it perfectly channels the many-layered book-as-art-object underpinnings of Nagamatsu’s eerie debut collection. Where We Go When All We Were Is Gone is haunting literary work, and I mean that literally: ghosts populate the book. The collection is set in modern Japan, where the dead, the undead, and countless characters from Japanese pop culture and cultural myth struggle to exist, and coexist, at the edges of the human world. From Godzilla to Momotaro, Nagamatsu leaves no magical being unconsidered, always extending grave sympathy to the (lived?) experience of contact with, or embodiment of, the supernatural. The collection is often dark, and doesn’t move with the verve I first expected from work touted as lowbrow-literary hybrid. But fast-and-fun wouldn’t fit this book, one wholly centered on loss and loneliness. I don’t mean to say Where We Go When All We Were Is Gone is heavy. Maybe somber would be more accurate; I kept taking breaks as I read, craving time to reflect on Nagamatsu’s characters and even grieve for them. Like Mayu, the scientist who dies studying Godzilla, Mothra and the other enormous Kaiju creatures, I began to feel compassion for those at the spirit margins of the everyday, reflecting on how I’d eventually join them too. Where We Go When All We Were Is Gone occasionally goes too far for me, detouring into the territory of writers who I suspect use weird news events or Wikipedia-diving to generate writing prompts (anyone remember that ghost ship full of cannibal rats?). One such piece centers on placentophagy, the practice of eating one’s placenta after giving birth, and leads off with a recipe for a Placenta Bloody Mary. Still, I respect Nagamatsu’s commitment to the weird. He goes where other writers won’t, and though he may gross you out, it’s almost always emotionally earned. Take Rokurokubi, the story about a man who can stretch out his neck; he visits friends by pushing his head through plumbing pipes and coming up out of the toilet like a human snake. The poor man has kept his demon-driven secret from his wife for so long, their marriage has finally rotted. And I’m still reflecting on Girl Zero, a devastating story in which a special-needs daughter drowns in a neighborhood pool, then miraculously appears again years after her death. Her father has caused a mysterious cave-creature to take on what turns out to be her physical appearance, her personality, and even, perhaps, her soul—but not her disability. Ultimately, Where We Go When All We Were Is Gone is worth a read. Even if ghosts, spirits, and demons aren’t your scene, I still recommend the book unreservedly. It is a well-crafted text that should be part of conversations on great work in indie publishing right now, and never requires a love of genre to inspire love for its situations and characters. Nagamatsu is an arresting liaison, deftly slipping between literary art and ghost story, between this world and the next. Doing so, he invites necessary, even radical sympathy for the ugly, the uncomfortable, the dead, and the dying, demonstrating why this debut collection is one of significant literary talent—the ephemera of an emerging writer who will inevitably lead us on to even more mysterious and unexpected places as his fiction writing career continues.